Opposition parties in the DRC have condemned the decision by the electoral commission to postpone the December 23 vote. The postponement threatens to throw the mineral-rich country into further political turmoil. "We do not want this [electoral] commission anymore," Felix Tshisekedi, one of the main opposition candidates, declared, following the decision to postpone the elections. "We are ready for elections this Sunday," Tshisekedi said, as he threatened to call on his supporters to protest. Tshisekedi has since softened his stance and told reporters on Friday that he will accept only a one-week delay. "Not a day more." Initially scheduled for December 23, Congo's general election was pushed back after a fire in the capital Kinshasa destroyed 8,000 of the newly purchased 10,368 electronic voting machines. Congo's Independent National Election Commission (CENI), sought to reassure voters that the election would proceed as planned and that they had ordered replacements for the voting machines a day after the fire broke out. Then on Thursday, December 20, Corneille Nangaa, head of CENI, summoned all the presidential contenders and shortly afterwards announced that, due to the shortage of ballot papers caused by the fire, voting would only take place a week later. 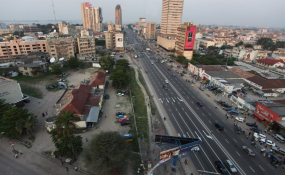 On the streets of the capital Kinshasa, opposition supporters were furious. "We gave Nangaa two years and he did nothing. What can he achieve in just a week?" one Kinshasa resident told DW. "We are grown-ups, he can't treat us like children. It's enough! We will pay the price for our children to liberate our country." Another opposition supporter of Felix Tshisekedi's Union for Democracy and Social Progress (UDPS), called on the international community to put more pressure on the Congolese leaders and CENI. Masha Labonga, a hair dresser in Kinshasa, told DW it was futile to wait for President Joseph Kabila and CENI to organize the elections. "In 2016, we were there. The constitution said that on December 19, Kabila's mandate ended. It did not happen," Labonga said. "December 23 was the [election] date; they are now talking about the 30th. What is there to reassure us that there will be elections on the 30th?" Labonga asked. "We must demonstrate to have elections and have a different regime just like the yellow vests did in France." The postponement of the election is just one of the many concerns that surround the credibility of the election in DR Congo. "The voting machines themselves have been a significant issue of contention for the opposition," Ryan Cummings, director of Signal Risk, an Africa-focused political and security risk management consultancy firm, told DW. The opposition alleges that the voting machines procured from South Korea could be easily manipulated by CENI agents or the ruling Common Front for Congo (FCC) coalition, to give Emmanuel Shadary, President Kabila's preferred choice, the victory. "The other core concern relates to the logistics, transporting the biometric voters' cards and ballot boxes to the various constituencies across the country," Cummings said. The opposition accuses CENI of conducting the exercise without transparency. The election campaign in the DRC has been marred by violence, political protests and, in some cases, police firing on opposition supporters. The US embassy has withdrawn most of its non-essential staff. It also issued a warning to its citizens to avoid large crowds and demonstrations. Fatouma Bensouda, chief prosecutor at the International Criminal Court (ICC), issued a statement saying she was concerned about the risk of escalating violence that could lead to grave crimes being committed in the DRC. "There is certainly the potential for violence," Cummings said. "The big issue is whether the election itself will be perceived as being free and fair." Who will lead this mineral-rich country? DR Congo's mineral wealth is estimated to be $24 trillion (21 trillion euros), yet most of its citizens remain poor. The stakes in the upcoming election could not be higher. Whichever of the four main candidates; Martin Fayulu, Vital Kamerhe, Felix Tshisekedi and Emmanuel Shadary, wins, will be faced with multiple challenges. There is a hunger crisis in the central Kasai region where many people have also been displaced due to violence, an outbreak of the deadly Ebola virus in the east which has already claimed more than 270 lives and the perennial conflict of armed militia groups in Northern Kivu Province. Voting in some of these regions is likely to be disrupted. "Unfortunately the election itself is not going to be perceived as legitimate and representing the will of all the Congolese people," Cummings said. This he concludes could be a potential catalyst for violence.